This medicine is an antiviral agent used to treat the flu (influenza A and B) in patients one year of age and older who have had symptoms for no more than 2 days. Oseltamivir is also used to prevent the flu in patients age one and over in the U.S. who must be in close contact with someone who has the flu, such as another household member. This medicine may be used for other conditions as determined by your doctor. 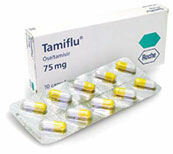 Tamiflu will take 15 days to ship. BEFORE USING THIS MEDICINE: Some medicines or medical conditions may interact with this medicine. INFORM YOUR DOCTOR OR PHARMACIST of all prescription and over-the-counter medicine that you are taking. DO NOT START OR STOP any medicine without doctor or pharmacist approval. Inform your doctor of any other medical conditions, allergies, pregnancy, or breast-feeding. Use of this medicine in children under age 1 for treatment of the flu is not recommended. Discuss with your doctor the benefits and risks of giving this medicine to your child. Contact your doctor or pharmacist if you have any questions or concerns about taking this medicine. HOW TO USE THIS MEDICINE: Follow the directions for using this medicine provided by your doctor. This medicine comes with a patient information leaflet. Read it carefully. Ask your doctor, nurse, or pharmacist any questions that you may have about this medicine. Begin taking this medicine as soon as you notice symptoms of the flu. THIS MEDICINE MAY BE TAKEN WITH FOOD if it upsets your stomach. STORE THIS MEDICINE at room temperature below 77 degrees F (25 degrees C), away from heat and light. TO CLEAR UP YOUR INFECTION COMPLETELY, continue taking this medicine for the full course of treatment even if you feel better in a few days. Do not miss any doses. IF YOU MISS A DOSE OF THIS MEDICINE, take it as soon as possible. If it is within 2 hours of your next dose, skip the missed dose and go back to your regular dosing schedule. DO NOT take 2 doses at once. CAUTIONS: DO NOT TAKE THIS MEDICINE if you have had an allergic reaction to it or are allergic to any ingredient in this product. IF MODERATE TO SEVERE DIARRHEA OCCURS during or after treatment with this medicine, check with your doctor or pharmacist. Do not treat it with non-prescription (over-the-counter) medicines. DO NOT DRIVE, OPERATE MACHINERY, OR DO ANYTHING ELSE THAT COULD BE DANGEROUS until you know how you react to this medicine. Using this medicine alone, with other medicines, or with alcohol, may lessen your ability to drive or to perform other potentially dangerous tasks. POSSIBLE SIDE EFFECTS: SIDE EFFECTS that may occur while taking this medicine include nausea, vomiting, or dizziness. If they continue or are bothersome, check with your doctor. CONTACT YOUR DOCTOR IMMEDIATELY if you experience reddened, blistered or swollen skin; or swelling of the face or tongue. An allergic reaction to this medicine is unlikely, but seekimmediate medical attention if it occurs. Symptoms of an allergic reaction include rash, itching, swelling, severe dizziness, or trouble breathing. If you notice other effects not listed above, contact your doctor, nurse, or pharmacist. OVERDOSE: If overdose is suspected, contact your local poison control center or emergency room immediately. Symptoms of overdose may include nausea and vomiting. DO NOT USE THIS MEDICINE for other health conditions. The information in this monograph is not intended to cover all possible uses, directions, precautions, drug interactions, or adverse effects. This information is generalized and is not intended as specific medical advice. If you have questions about the medicines you are taking or would like more information, check with your doctor, pharmacist, or nurse.